Last Friday, legislators passed a budget bill that included a provision that would, in part, authorize the State Board to order small districts to merge into another when the system is at risk from contamination or insufficient supplies. The bill also requires metering for users diverting more than 10 acre-feet of water annually and allows agencies to issues fines up to $10,000, plus up to $500 per day for continued violation, to people who violate water conservation measures. The bill would also temporarily exempt certain water recycling and groundwater replenishment projects from requirements of the California Environmental Quality Act. As this bill is part of the state budget, it must be decided on before the next fiscal year, which begins July 1st. So far, 31% of water rights holders who were issued curtailment notices (representing 78% of the total curtailed water demand) have submitted compliance notices to the State Water Resources Control Board. The Marin Municipal Water District is being sued for its tiered rate structure, while the California attorney general’s office has asked the state Supreme Court to depublish a ruling that found the city of San Juan Capistrano’s rate structure to be unconstitutional. The Attorney general’s office claims the opinion is “likely to create confusion and uncertainty”. The Department of Water Resources has issued proposed revisions to the Model Water Efficient Landscape Ordinance. The revisions would ban grass in medians, prohibit the installation of non-functional turf in new construction, and require the installation of specific, more water efficient irrigation systems for landscapes. The revisions also reduce the size threshold (the square footage above which projects are subject to the ordinance) for all new constructions projects from 2500 sq. ft. to 500 sq. 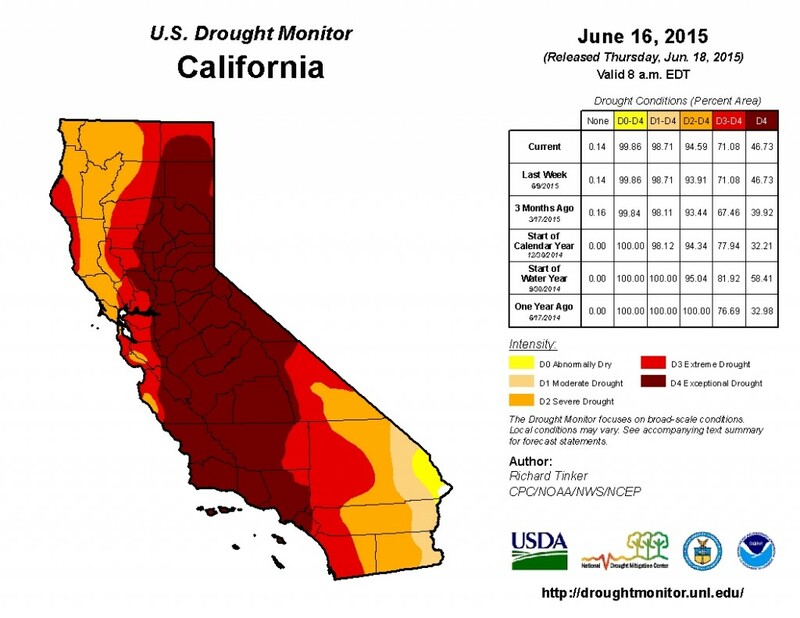 ft.
Drought conditions remain essentially unchanged from two weeks ago. 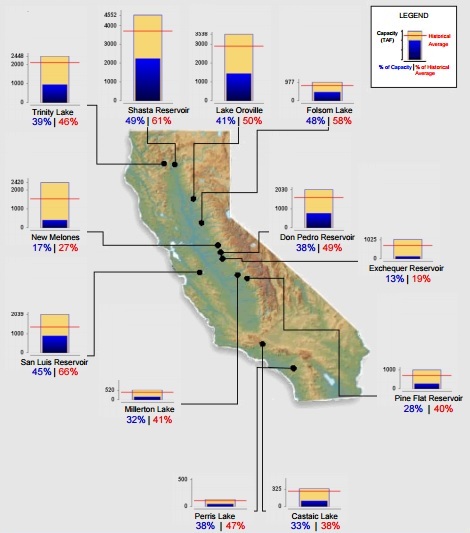 Statewide, California’s major reservoirs (representing 27.3 million acre-feet of storage) are at 40% of capacity and 53% of group average.